TSO Bollinger Bandit Strategy is an indicator based on the Bollinger Bandit Trading Strategy as presented in the book Building Winning Trading Systems with TradeStation by G. Pruitt and J. R. Hill. A complete entry and exit strategy for trending markets. Get email / push notifications when an entry signal occurs. This strategy uses the Bollinger Bands as breakout indicators, i.e. 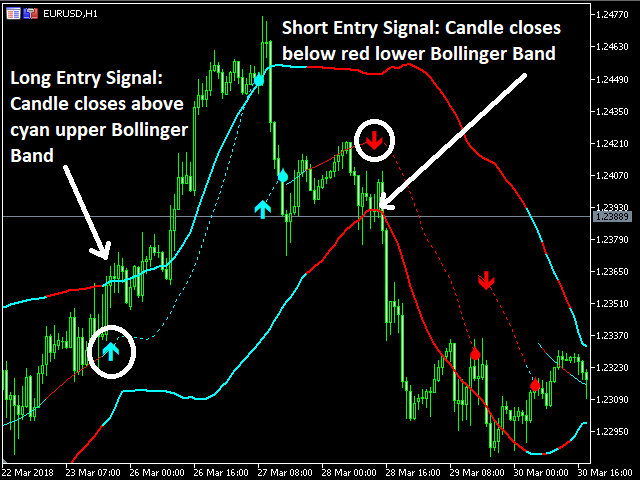 a potential long entry signal is generated when a candle closes above the upper Bollinger Band and a potential short entry signal is generated when when a candle closes below the lower Bollinger Band. To have an entry signal, except from passing the Bollinger Bands, the close of the current candle must be greater than the close of X periods ago for a long entry or lower than X periods ago for a short entry. When a position is initiated, a stop loss is set at a Moving Average. For every period that the strategy remains in a position, the number of periods used for the Moving Average calculation is reduced. This happens until a minimum limit for the Moving Average period is reached. From that point on the period of the Moving Average remains constant. To create an exit signal the moving average must be below the upper band if we are long and above the lower band if we are short. This element was added to prevent the system from going back into the same trade that was just liquidated. Period: The period of the Bollinger Bands. Deviation: The number of standard deviations between the bands and the moving average. Shift: Number of time periods to shift the Bollinger Band indicator. Apply to: The candle price on which the Bollinger Band calculations will be based. Period: The period of the Moving Average. Rate of Period Reduction: The amount by which the period of the Moving Average Stop Loss is reduced at each candle after an entry signal. Minimum Period: The minimum limit for the period of the Moving Average Stop Loss. The Moving Average will remain constant when this period is reached. Shift: Number of time periods to shift the Moving Average indicator. 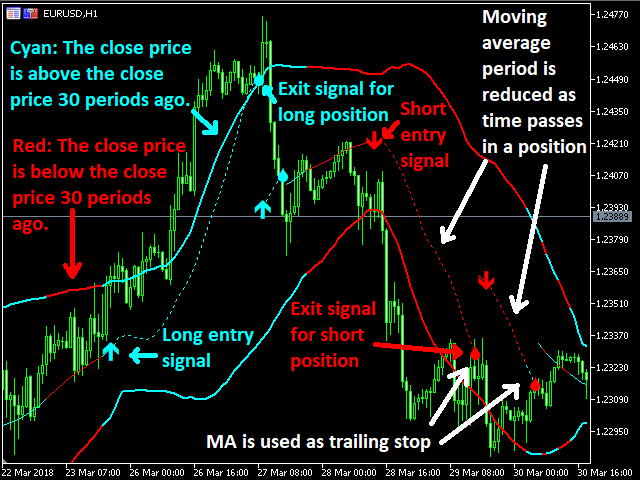 Method: The method used to calculate the Moving Average. Apply to:he candle price on which the Moving Average calculations will be based. Lookback Period: The number of periods to look back for the previous close to compare with the current close and confirm the entry signal. ENABLE Metatrader Alerts: Set to "true" to receive an alert on the Metatrader platform when an entry signal appears. ENABLE Email Alerts: Set to "true" to receive an email alert when an entry signal appears. ENABLE Push Notifications: Set to "true" to receive a push notification on your mobile phone when an entry signal appears.